We are joined once again by film critic Kristen Lopez to discuss the representation of disability in cinema. This time we dive into the horror genre with Mike Flanagan’s 2016 thriller Hush. The film focuses on a writer who is deaf whose solitary life in the woods is disrupted by a masked killer. We also take a moment to dive into our two short film picks (available online for free): Rob Savage’s Dawn of the Deaf and Charlotte Wells’ Laps. 6:42 – Dawn of the Deaf by Rob Savage. 20:38 – Laps by Charlotte Wells. If you like what you hear, or want to offer some constructive criticism, please take a moment to rate our show on iTunes! If you have a comment on this episode, or want to suggest a film for us to discuss, feel free to contact us via twitter (@ChangingReelsAC), follow us on Facebook and reach out to us by email (Changing.Reels.AC@gmail.com). You can also hear our show on SoundCloud or Stitcher! Cohost of Changing Reels, Courtney Small from Cinema Axis, consumes everything cinema from big budget spectacles to small foreign fare. He has contributed pieces to various publications and has been a guest on several film related podcasts. Courtney is also a member of the Online Film Critics Society as well as the Canadian Association of Online Film Critics. Cohost and Editor of Changing Reels, Andrew Hathaway from Can’t Stop the Movies, is more of a hermit than his charming cohost. He spends what may be seen as an unhealthy amount of time analyzing cinematic fare as light as Magic Mike XXL and as enigmatic as The Midnight Swim. When he’s not taking a deep dive into cinema he’s contributed to books like Thoughts on The Thin Man. The partnership between Andrew and Courtney started through their podcast series on the movies of Denis Villeneuve and blossomed into Changing Reels. 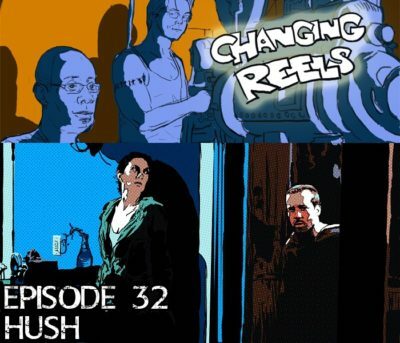 The art for Changing Reels comes commissioned from Seth Gorden, one of the creative minds behind Earnest and Purcell.